How Pygmy Boats Came to Be… or… Where all Roads End the Real Adventures Begin! John Lockwood in his Clepper in 1970. John Lockwood on crutches in 1970. John needed a light yet rugged boat that he could haul up on beaches while using his crutches. 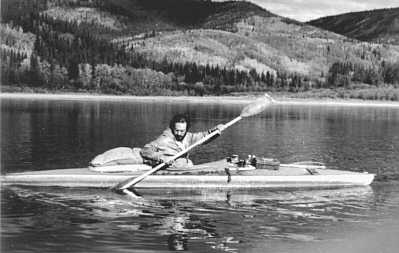 In 1970, Pygmy founder and designer, John Lockwood, took his first extended solo kayak trip–900 miles down the Yukon River. Fleeing the stuffy halls of Harvard, he loaded a collapsible Klepper on the Trans Canadian railroad and headed for Whitehorse in the Yukon. While studying computer science and anthropology in Cambridge, the nickname “Pygmy” attached itself to John due to his admiration of the peaceful Pygmy (or Mbuti) people of the African rain forest. They live as free-ranging hunter gatherers. So “Pygmy” lived mostly off of snared rabbits, and fished for pike and grayling, as he paddled his way toward Circle, Alaska. The mighty Yukon with her resident abundance of grizzly, black bear, badger, wolf, and eagles brought John the “Peace of Wild Things” (see poem below). A fall at a construction site destroyed his right hip in 1968 and put John on crutches for 8 years. This trip taught him that a kayak could still get him into deep wilderness, using upper body strength. In 1971 John found the lush Queen Charlotte Islands lying 90 miles off the coast of British Columbia in deep rain forest. Here he built his first stitch-n-glue kayak–an early version of our Queen Charlotte. He needed a light, rugged kayak he could drag up the beach on crutches. Paddling 4 months out of the year, he ate from the sea’s bounty of mussels, clams, oysters, octopus, salmon, star fish eggs, 7 kinds of rock fish, whelks, etc. A home sewn teepee and a string of poles set up along the coastline gave him shelter as he explored the remains of Haida long houses, totem poles, innumerable islands, bays, and streams pouring from steep mountains cloaked in ancient cedar and fir forest. Two and one half years passed quickly. John returned to the U.S. to replenish his funds as a computer software engineer. 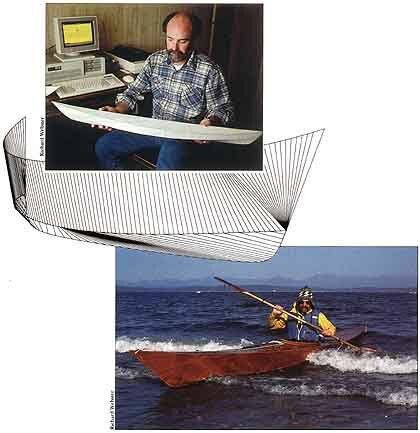 By 1985, John had moved to Seattle, been a computer geek for several big firms and really wanted to be building kayaks. He quit his corporate jobs to spend a year designing the world’s first commercially available plate expansion software. His software revolutionized steel ship building. Naval architectural firms in the US and Australia bought his software to design steel freighters. Always an avid paddler, he longed to be creating kayaks. The beauty of human powered craft held fascination & passion — a path into the wilderness! Designing software was not as much fun. In November of 1986– John “Pygmy” Lockwood sold the first Queen Charlotte Kayak kit. In a 3-car garage workshop behind his house, he cut out the planet’s first computer designed, ultra-light, ultra-accurate boat kit… Pygmy Sea Kayaks was born! John did it all — design, cutting, shipping, and ads at that point. The operation moved to Port Townsend in 1987 to be in a small seaport. By 1991 John had one shop employee. The following year, Pygmy released the GoldenEye-Standard and Hi Volume. These multi-chine kayaks in the Alaskan style simply gave customers more choices. By 1994, the GoldenEye-13′ was added for small adults and youth. When John’s daughter Freya turned 5 and learned to swim well enough he designed the GoldenEye-10′ for her 5th birthday. Soon after, the Osprey series emerged with our Double and Triple. We have expanded our boat kit line to include 21 wood kayak models, our rowing skiff, the Wineglass Wherry, and our wooden canoe the Taiga. Over the years we have been voted “Best Kit Kayak” and “Best Wooden Kayak”. We attribute our success to the recommendations of thousands of people who have built and paddled Pygmies over the last 26 years. Their words of praise and encouragement bring hundreds of calls our way each month. We find our greatest pleasure and satisfaction in the smiles of our delighted customers and pride ourselves on offering the best support in the industry.